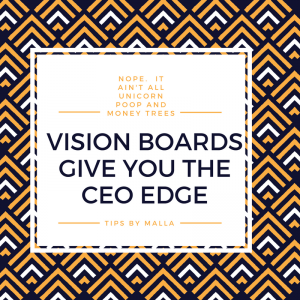 Vision boards give you the opportunity to fully step into the CEO role. You get to dream big and set the vision for the company. What impact could you make if your product or service comes to market? In the early stages of a business, this is a no brainer. You have plenty of time to do this. And this is often the FUN part of getting started. When I talk to people who are still in the early stages, they talk in this language. What they dream about. Being able to make a difference. Their goals. These soul sucking tasks often take twice as much time as you thought and require you to constantly put out fires. It gets hard to step away and think big. Yes. When you are dealing with big issues or stuck in a day to day struggle, it’s hard to think about possibilities, dreams, and ideas. Yet that is EXACTLY the foundation that you need in your business. Yes, you need to be solving your client’s problems. And providing a needed service that produces a profit. But you also want to build your overall company on a larger vision. Something that gets people engaged to do business with you. Because you stand for what they stand for. If you are like me, you have stacks of notebooks and books about all things on how to run your business better. You’ve been to dozens of conferences. Attended enough networking events to win honorary degrees. But if you haven’t taken time to step away from the day to day – plan for it. The best option is to take a few days and go out of town. Yes, I know it costs money. Honey, Groupon and Travelzoo.com got deals. And if you are into travel hacking, use the rewards from your credit cards. (Which is one of the few ways I recommend using credit cards without hesitation). Track flights via Google Flights or ITA. Or use the new startup in town, Airfordable, that let’s you “lay-away” for your flights. And if you are complaining that you don’t have the time – figure it out. There are always ebbs and flows in your business cycle. Honey, you DESERVE this. You NEED time away to refresh and recharge. When you return home, you will be in a MUCH clearer state of mind. You’ll be able to solve better solve problems your business is having. Which translates into more profits. I bet you’ll probably be willing to try new routines. I started going to bed at a decent time after a recent vacation. Yesssss! You might even be in a different mental space that invites new people in your network. People who have the tools to help you solve the “bigger” problems. It’s always much easier to hear tough suggestions after you return home with new eyes. I got you. Spend 1 day in a space completely different from your own. Go to Breather if you are in a big city. Or go el cheapo and squat at your local Starbucks and keep your cup refilled. Honey, it don’t matter where. Bring 1 or 2 other like minded friends or go solo so you can get more done. Start first by reading or doing some journaling. Or take a long walk in nature. DO not start with an action step or specific activity. Because you need time to decompress and refocus. Then sit down and start to dream big again. Start to envision what is possible for you. What is possible for your business. 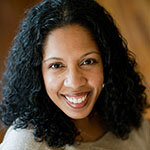 What those who are impacted by your business will gain – ie. customers, vendors, employees. Step back and dream big. DO NOT LISTEN TO THE NAYSAYERS IN YOUR MIND. Put those pics down in your board. And use those ideas to build your business model and long term business plan. You’ll create a business that makes you smile AND makes you money.